Today, I thought it would be kind of fun if I shared what I cart around in my nappy bag on a daily basis. You get a lot of insight about people when you know whats in their bag! From my bag the insight you get is that I change A LOT of nappies!!! As a Mum of a baby and a toddler I feel like a pack horse most of the time. My bag is is usually full to almost overflowing. I usually forget multiple things and have to run back and forth from the car getting all the forgotten items. These days leaving the house can be such a mission! So, when I leave I obviously have some (or a lot of) staples, things I cannot survive without! 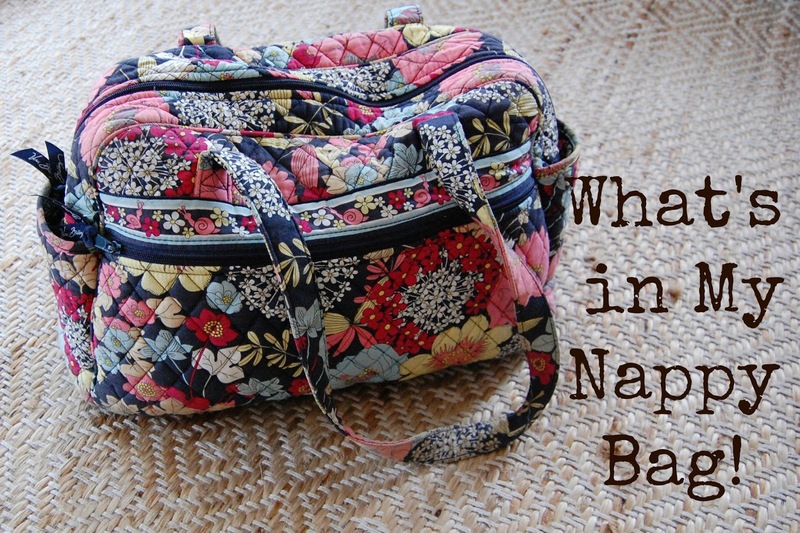 My nappy bag of course, which is a Vera Bradley 'Diaper Bag'. I'm not sure if you can get them in Australia now, but when I got this (2 years ago) I had to get my in-laws to bring it over from the US. I love it, and it has lasted really well with all the daily use! The pattern and quilted material hide any dirt or marks, and it has lots of great pockets inside and out and big straps so its easy to put over my shoulder! 1. Nappies: It wouldn't be a nappy bag without the nappies! One in cloth and one still in disposables, I am preparing to make the change soon, but just as we are adjusting to having two in nappies I have been putting it off. But I hate going through so many disposables!! 2. Change Mat & Wipes: A friend bought me this nifty little handmade mat with wipes pocket when I was pregnant with Ezra. It is so nice because it rolls up into a nice little clutch that fits the wipes and 2 nappies inside. 3. Breastfeeding Cover: Made for me by a lovely colleague when I was pregnant with Ezra! It comes in handy often! 4. 2 Outfit changes for Willow, because you never know when you are going to be presented with multiple Pooplosions, so my motto is 'be prepared', because I've been caught out before! One outfit isn't enough! 5. Hat: Because toddlers like to play outside, and babies and sunshine don't go so well together just yet! 6. Drink bottle: for the boy who likes to play hard! 7. Lip Gloss: I can't go anywhere without it 8. Hand Sanitiser: Because no one likes having poop on their hands! 9. A Stash of Tissues: Because toddlers are snotty! 10. Cars: Come in handy very often. They give me 5 minutes extra when waiting for food at restaurants or something to distract a grumpy kid in the car! 11. Nice smelling nappy bags! Because I don't want my bag smelling like poop! Usually I also carry a reusable Wet bag for the cloth nappies or wet clothes or whatever needs storing separately. 12. Wallet (for obvious reasons) 13. Sunnies: because I like to look super cool! Oh, and they also help keep the sun out of my eyes. Then I add snacks or lunches for the toddler and whatever else is specific to our outing for the day! So thats what's in my nappy bag, what's in yours? Did you know I now have a fortnightly newsletter?